This family-run hotel lies in the heart of Heede, in the Emsland district of Lower Saxony. The Hotel zur Linde provides comfortable accommodation in relaxing surroundings for guests looking to escape from the stress of everyday life. Situated in Heede, this holiday home features a children's playground. The property is 43 km from Emden and boasts views of the sea. Ferienwohnung Mauer, Wohnung "C" - [#69209] is located in Heede and offers a garden and a terrace. The apartment is in an area where guests can engage in activities such as cycling, fishing and hiking. Located 42 km from Emden, Mauer Wohnung "A" - [#40163] offers accommodation in Heede. The unit is 49 km from Assen. 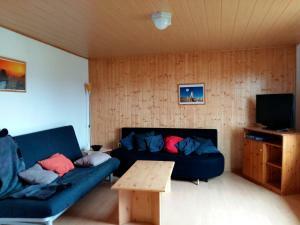 Located in Heede, Wohnung "ROT" - [#75971] offers accommodation with a terrace and free WiFi. The apartment is in an area where guests can engage in activities such as cycling, fishing and hiking. Wohnung BRAUN - [#75986] is situated in Heede. Guests staying at this apartment have access to free WiFi and a terrace. Set 42 km from Emden and 49 km from Assen, Mauer Wohnung "Ost" - [#38624] offers accommodation in Heede. The unit is 12 km from Papenburg. Featuring accommodation with a terrace, Ferienwohnung 1 Struven Hus - [#40336] is set in Lehe. The accommodation is 11 km from Papenburg. Set in Lehe in the Lower-Saxony region, Ferienwohnung 4 Struven Hus - [#40339] features a terrace. Guests may enjoy free WiFi. Located in Lehe in the Lower-Saxony region, Ferienwohnung 2 Struven Hus - [#40337] features a garden. This apartment features accommodation with a terrace. Hotel Haus Lüssing is offering accommodation in Lehe. All rooms boast a TV with satellite channels and a private bathroom. Hotel Gasthaus Westhus in Dörpen features a terrace and a bar. Free WiFi is available. Położony zaledwie kilka minut jazdy od granicy z Holandią, ten rodzinny hotel trzygwiazdkowy w miejscowości Dörpen oferuje przytulne pokoje, tradycyjną restaurację i doskonałe połączenia z autostradą A31. W pokojach w hotelu Akzent Borchers, które wyposażone są w łazienkę i dostęp do szerokopasmowego łącza internetowego, mogą Państwo liczyć na spokojny sen. Featuring accommodation with a terrace, Lazy Horse Ranch - [#26956] is set in Rhede. Guests staying at this apartment have access to a fully equipped kitchenette. Offering rooms with free Wi-Fi, this hotel is just a 7-minute drive from the Dutch border. Situated in the quiet village of Rhede (Ems), it features a wine cellar and a skittles alley. Ten hotel jest usytuowany obok wspaniałej twierdzy Bourtange, w spokojnej okolicy w regionie Westerwolde, i zaprasza na relaksujący, romantyczny pobyt w historycznym otoczeniu. Przestronne pokoje w hotelu Vesting Bourtange są stylowo urządzone. Ten rodzinny hotel położony jest w malowniczym powiecie Emsland, w odległości 10 minut jazdy od centrum miasta Papenburg. Goście obiektu Landhaus Riedel mogą bezpłatnie korzystać z WiFi i parkingu. Only 2km from Bourtange, H.R. Restinn offers unique free-standing hotel rooms with free Wi-Fi in a peaceful green environment, only 2 km from the centre of the Bourtange stronghold. The grounds include a restaurant with rustic décor which serves traditional Dutch meals including pancakes.